NewGov have just released a new poll: Compared to the results of the 2014 EP elections: [Labour 25%, Conservatives 24%, UKIP 28%, Lib Dems 7%, Others 18%] this shows Labour, the Lib Dems, and the combined Brexit/UKIP parties roughly unchanged and the Conservatives down 8%. Compared to the Hanbury poll published in the Diary above and conducted just a few days earlier this new YouGov poll shows Labour are down 14, Conservatives -7, Brexit Party +5, UKIP +6.5, Lib Dems (no change), Greens +4, and ChangeUK +3. 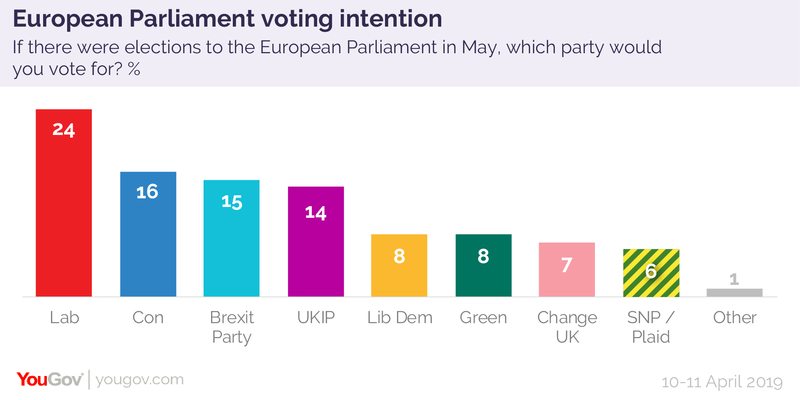 The official Launch of the Brexit party (and unveiling of Rees-Mogg's sister as a candidate) may give the Brexit party a further bounce, but it is harder to explain the boost to UKIP and the fact that Labour have lost more than the Conservatives. However the Conservatives, at 16% are probably close to their irreducible core vote (and in line with my prediction!) and probably can't fall much further. Based on these figures, Leave supporting parties are at 45% but I don't know to what extent the poll take account of differential Remain/Leave turnout. YouGov's standard general election polling has Labour on 32 and Conservatives on 28%. 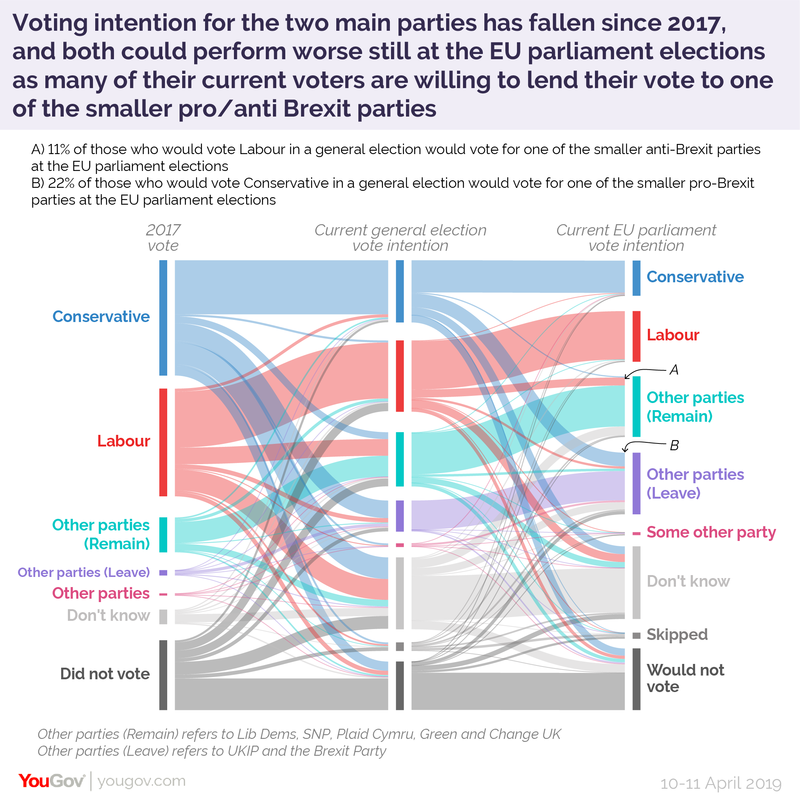 For the EP elections Tory supporters are defecting mainly to UKIP and the Brexit party while Labour supporters are defecting to the Greens, Lib Dems and Change UK. Buried in the small print of the detailed results is the fact that over 40% of respondents would not vote (18%), didn't know how they would vote (21%) or refused to answer (2%). 19% of those who voted Leave in 2016 said they would not vote while only 7% of 2016 Remain voters said they would not vote. Although voters typically overstate they intentions to vote, a high poll (by EP elections standards) still seems likely and there are still a lot of don't knows to be swayed either way. Voting patterns seem much more fluid than in a general election, and even if there were a general election, only 60% would vote Labour or Tory. In that respect the UK is increasingly resembling the European norm, with the traditional mainstream centre left and centre right parties losing more and more support to fringe parties, chiefly on the right.